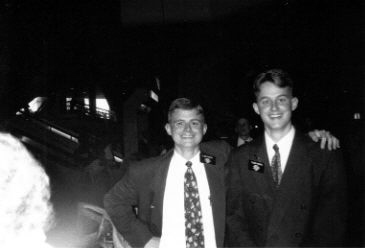 Jordan and John grew up primarily in Richardson, Texas but also lived in Connecticut and Utah as kids. Jordan was born just 18 months prior to John. Jordan and John have a lot in common. They both studied German throughout high school and had a rule (enforced more strictly some times than at others) that they only spoke German to each other in the room they shared growing up. They both served German speaking missions (pictured above when they went on splits in Berlin in June 1996), pursued degrees in foreign language and literature, and studied Yiddish in Lithuania, but in the end each opted for a career in the law. Jordan attended the University of Michigan Law School, while John attended the J. Reuben Clark Law School at Brigham Young University. Jordan is an attorney in San Jose, CA practicing in the area of Intellectual Property litigation, which among other things means he represents his employer in courts in issues centering around patents, copyrights, and trademarks. John is an attorney in London who focuses his practice on cross-border transactions, finance and international capital markets, and corporate law. Prior to practicing law, Jordan attended Brigham Young University and majored in German. John attended Brigham Young University with majors in German and European Studies, and a minor in Spanish. Jordan and John then received Master’s degrees at the University of Oxford, in Yiddish Studies and European Literature respectively. John then went on to law school, while Jordan began a Ph.D. program in German and Linguistics at the University of Michigan. After two years of that, Jordan also decided to attend law school. Jordan has six children and lives in San Jose, CA. John has four children and lives in London, England. Blogging has become a fun hobby we both share since we decided to run this blog. I thought you might be interested in this post on the OUPblog by Terryl Givens, author of People of Paradox: A History of Mormon Culture, in which he uses Mormon history to elucidate why discussion of Presidential candidate Mitt Romney’s religion is irrelevant. Perhaps you will consider recommending it to your readers? I have enjoyed reading through the posts and comments on your site. Thank you for visiting mine as well! I hope you come by often. The two of you have certainly been global! How cool that you can maintain a blog at such a distance. It is truly an amazing techno-world we live in. Rebecca, that is a wonderful article that you shared. I was not able to ascertain if the author is LDS or non-LDS, but either way he makes very astute and adroit observations. Something he did not mention, to add to the USA/Mormon Paradox, is that Joseph Smith made a bid to the US Presidency at one point. 2008 is shaping up to be a very “interesting” election. As of this morning, some real mud slinging has begun between Mitt and Rudy over their judge appointment decisions…ah, politics! JohnF, I am trying to track down contact info for you. Do you have a copy of the John Birch email you referred to on Mormon Mentality? The one that said something about Mormons should view Romney as a ravening wolf? If so, could you send it to the email address I entered? Thanks! It does not seem that President Kimball repudiated President Young’s teaching at all.